I was in Chiang Mai for 2 weeks in June this year. It was a really memorable trip, making new friends and forging unforgettable memories. I also went to a few different cafes to eat hence this guide would be in 2 parts. Part 1 would be my Top 5 favourites and Part 2 would just consist of the other places that I went to. 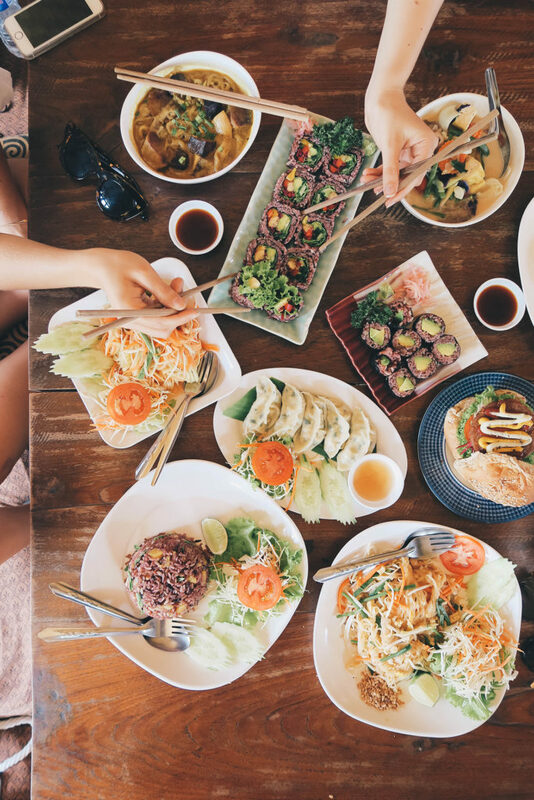 This is one restaurant where you will see huge groups of Vegans dining together. 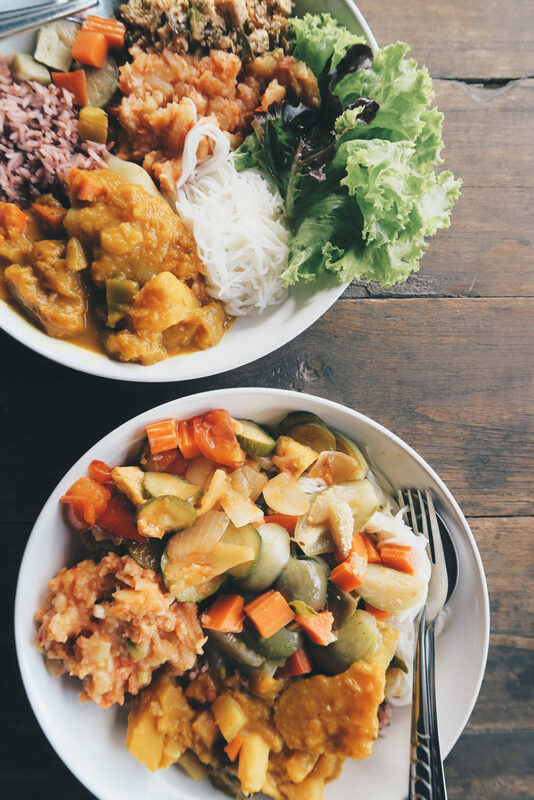 With large portions of food at affordable pricing, there is no doubt this restaurant is on everyone's 'List of Favourite Cafes in Chiang Mai'. My favourite is the 'Pad thai' and 'avocado sandwich'. In the entire trip, I probably visited this place three to four times. With so many items on their menu, you can't visit only once. Not to mention, the owner is really friendly too, so say hi when you are there! Now this is indeed every high carb vegan's favourite hangout especially during dinner. It's a buffet which also means free flow of carbs(!!!!) I can't remember the exact amount I paid for the meal... probably 200 or 250baht and it was so worth it. However, we went during lunch time so the selection of food was not so great but still decent (as above image) - the potato salad and Green Curry was my favourite. In my opinion, it is better if you head over during dinner time. You may also be able to meet new people and have a chat with them. I heard you also get a discount when you come on a push bike! The most visited cafe this trip has got to be Blue Diamond. Quite regularly, the girls and I will get breakfast here before starting our day. You cannot say no to the cinnamon rolls because they are SO good! Honestly the best ones I have tried! Blue Diamond is not a Vegan or Vegetarian cafe but they have tons of Vegan options especially for their desserts. I also tried the Pad Thai and Khao Soi over at Blue Diamond and it is not too bad. It is within the old city so you will be bound to see other cafes while walking here. 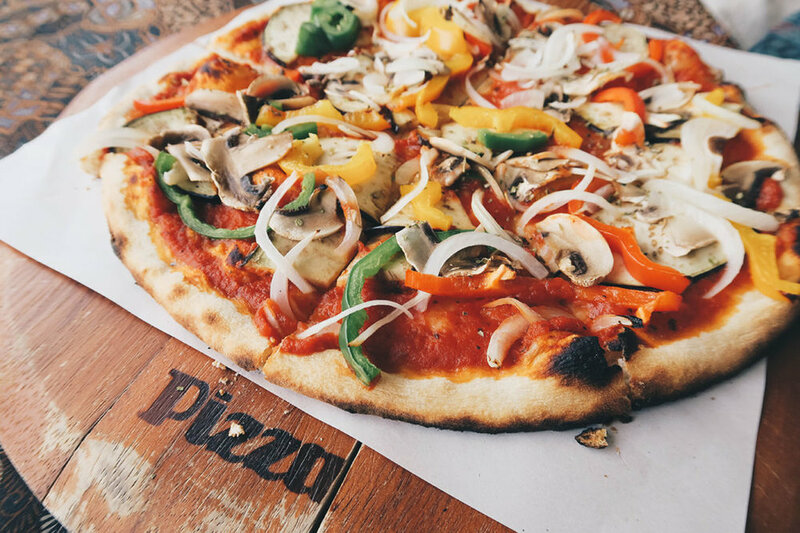 By Hand Pizza is also a walking distance from Blue Diamond. At Aum, there is such a wide variety of food that you will be spoiled for choice. Not to mention that the prices are rather affordable as well. Hearing how good the dumplings at Aum were, I decided to give it a try. I also ordered a Pineapple fried rice and Avocado Maki. The Pineapple fried rice was so-so and so was the Avocado Maki. But I do have to give it to the dumplings this time round. Perhaps I still prefer my sushi with white rice instead of brown and same goes for my fried rice. The food at Aum however, were cooked really healthily, no oil and not very salty too. Great for those who are oil-free and salt-free, as well as the health conscious ones :) They have a cozy second floor sitting, great for hanging out with large groups. 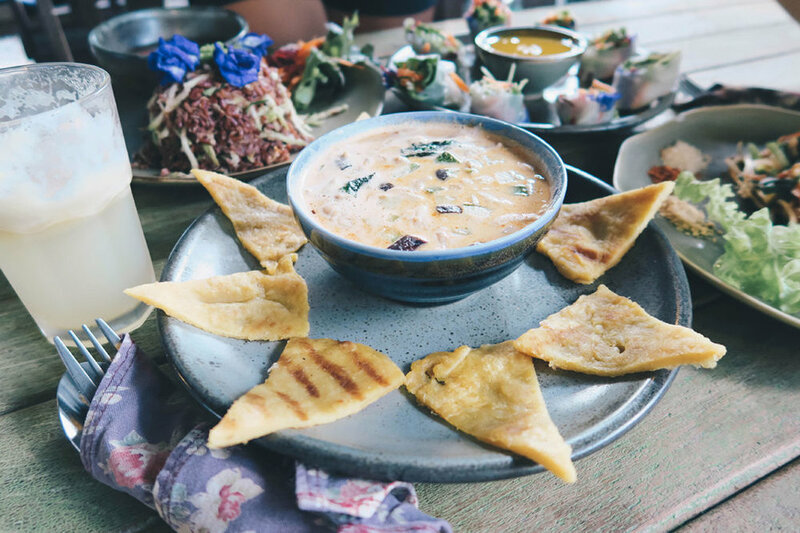 These are my Top 5 favourite Vegan/Vegan-friendly cafes in Chiang Mai! More reviews of the other cafes I went coming up in Part 2 :) If you have been to Chiang Mai, let me know which are your favourites, and if you plan to visit Chiang Mai, I hope this will be helpful to you!